Run for Light advocacy run will be held at the Bonifacio Global City in Taguig City on July 21, 2012. It is a fund raising event of Stiftung Solarenergie (StS) that will help finance the distribution of solar lanterns to rural villages. 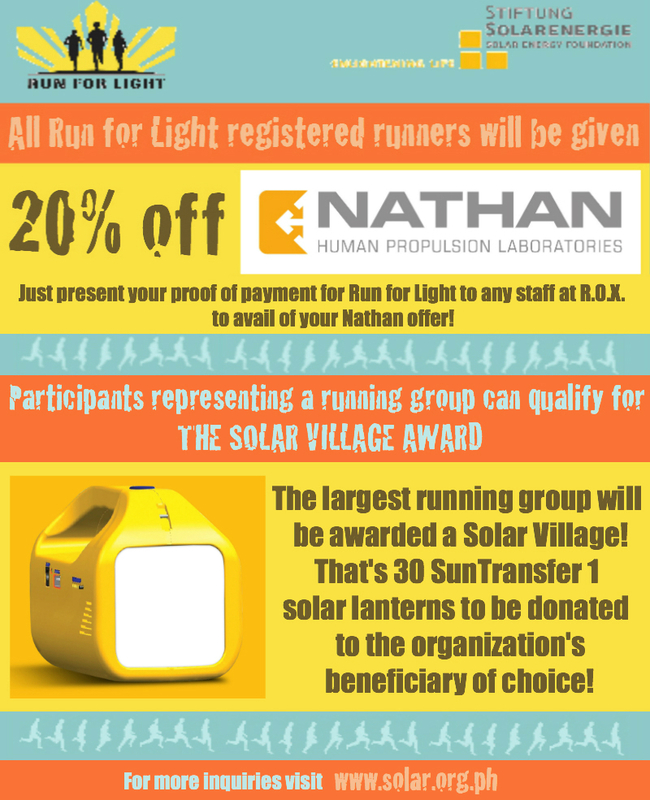 The launch of this pioneer running event is especially timely, as it coincides with the United Nations International Year of Sustainable Energy for All. 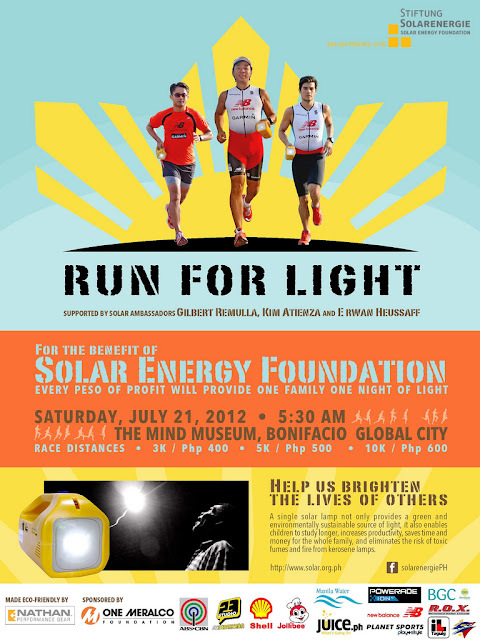 Apart from helping raise funds for the foundation, Run for Light will also be an event centered on advocacy and education. It will be an avenue to raise public awareness on the need to empower marginalized communities by bringing clean sources of light to their homes and an educational campaign focused on sustainable solar energy. 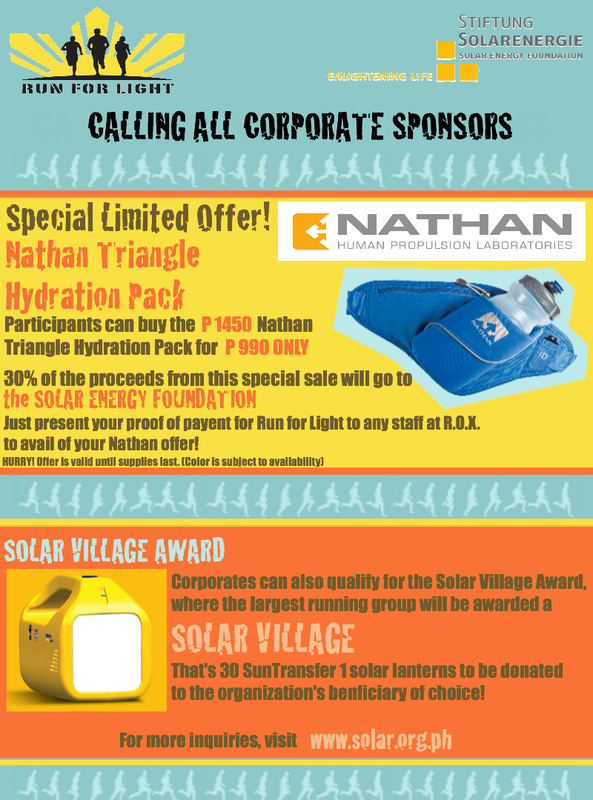 Race distances are 3K, 5K, and 10K with registration fees of P400, P500 and P600 respectively. This is one of the greenest race events in the country. In order to stay committed to this environmental advocacy, we strongly encourage you to bring your own hydration equipment (e.g. water bottles). Cups will not be provided, but there will be water stations where you can fill up your hydration equipment. Nathan has a special offer for all participants. To learn more about it, click HERE.